This skyscraper should have been called Tower 200, because the originally planned height of 185 meters was increased to 200 meters (as technical floors were included in the tower head, which are usually excluded from the zoning calculation). Tower 185 offers a much higher efficiency and flexibility of office space than traditional office buildings: the intelligent floor plan allows up to 35% more individual offices per floor than comparable high-rise buildings. 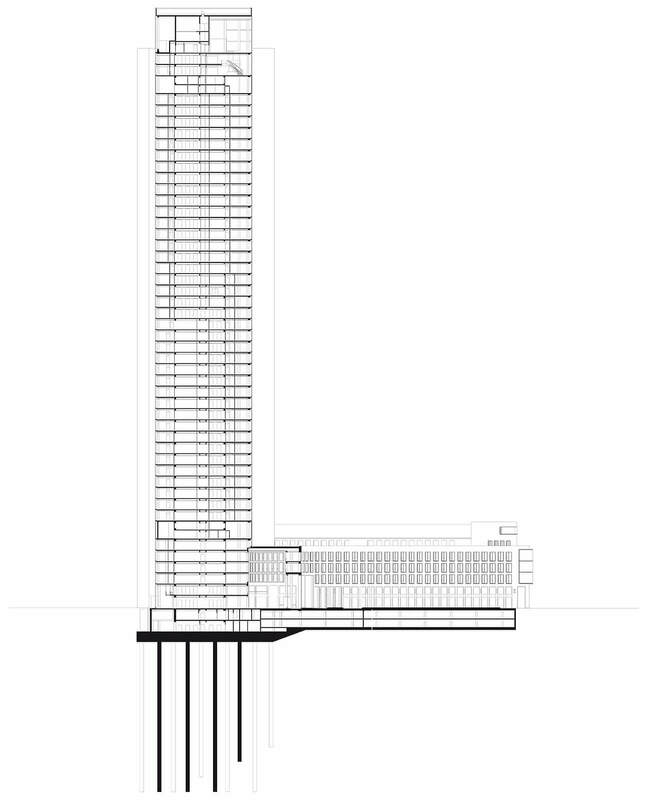 Tower 185 has a rentable area of ​​over 100,000 square meters (1,080,000 square feet). Thanks to modern energy concepts, costs are kept low in the long term. Reflective blinds with integrated glare protection prevent excessive heating of rooms. The large windows provide plenty of light and a pleasant atmosphere. 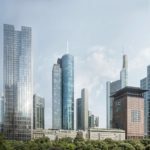 In 1998, the City of Frankfurt decided in the first high-rise development plan that the buildings of the former head office of the Deutsche Bahn at the Friedrich-Ebert-Anlage 35-37 may give way to a skyscraper, about 185 meters high. 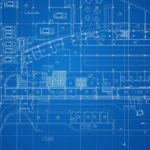 In the following years, however, no progress was made on the project. At the beginning of 2007, the existing buildings were demolished, after which the site was vacant. 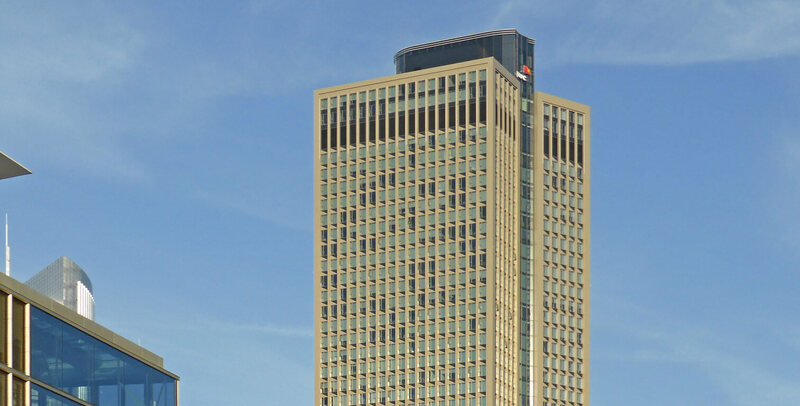 In the summer of 2007, several newspapers reported that a lease was signed between landowner Vivico and auditing firm PricewaterhouseCoopers (PwC) regarding Tower 185. This was officially confirmed in May 2008 when the project was presented to the public. The reason for the delay was apparently that Vivico needed a construction allowance by a neighbouring property, which was owned by the state of Hesse. In May 2008, the property then became owned by Vivico. 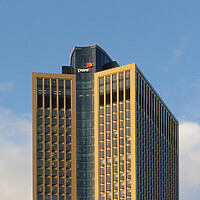 PwC had leased 66,000 square meters (710,000 sqaure feet) of a total of around 100,000 square meters (1,080,000 square feet) of office space over the long term and moved into the company’s new German headquarters building here. 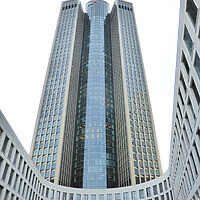 By that time, the company headquarters were in the Frankfurt Mertonviertel. Already at the end of 2010, the base of Tower 185 was completed and occupied by some departments of PwC. In the meanwhile, however, PwC has decided to reduce the space it occupied in Tower 185. Corresponding new lettings have taken place in the meantime. 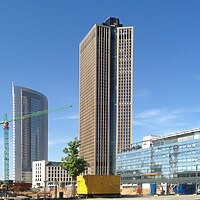 The architectural design for Tower 185 was provided by the Frankfurt-based architect, Christoph Mäckler. The design provides a horseshoe-shaped pedestal building, from which rise the two skyscraper halves with an aluminum-glass façade. These enclose a round glass middle part. 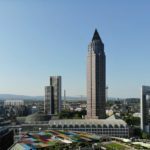 This skyscraper was erected by the HOCHTIEF construction company. The building has been awarded LEED Gold certification (Leadership in Energy and Environmental Design). LEED defines standards for environmentally friendly, resource-efficient, sustainable construction. Nevertheless, care was taken to ensure that a large number of windowed workplaces are created and that the windows can be opened to allow fresh to enter. In December 2017, DekaBank bought Tower 185. Dekabank, which acts as an investment service provider of the savings banks, paid a total of 775 million euros. 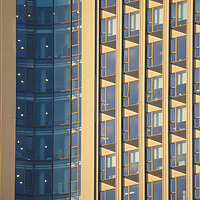 The building will work as an asset in the company’s own real estate funds. It was one of the largest transactions in the European investment market in 2017. 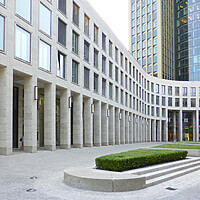 The sellers were CA Immo Deutschland, two pension funds and the real estate specialist, Fagas.